I am super excited about heading off next week for the Wheel Women Japanese Cycling tour which will see me riding in southern Japan. Our fabulous tour leader Tina McCarthy describes the tour as a full immersion in another world, with the boundaries of the old and the new criss-crossing at every turn. “From sublime temples to the dazzling orchestra of neon signs in the cities, our Wheel Women Japan Tour takes you on a journey across the sea, over bridges and among friends,” Tina says. Wheel Women’s Tina McCarthy, who has been travelling to Japan since 1986 when her love affair with Japan began on a university study tour, has developed the itinerary. “Across fourteen days we will adventure on bike from Honshu across to Shikoku and experience one of the world’s great cycling routes. We’ll eat magnificent food, meet local cyclists and explore the path less travelled by most tourists. Spectacular views, incredible food, Japanese friends and loads of laughter is what you can expect,” Tina promises, and I for one cannot wait. I also really like the idea that we’ll travel at a comfortable pace, stop, look, photograph and explore. As well as being a passionate road cyclist, I’m also a keen photographer so I’ll be wearing a backpack with my digital SLR camera in it, and I’ll be stopping whenever I like to take photos. I’ll still be riding a road bike but it’s not a carbon fibre bike, it’s a Specialized Diverge with an alloy frame and disc brakes, however I’ll still be wearing proper cycling kit and road cycling shoes. The journey comprises of 14 days of cycling, exploring, sightseeing and adventure in Hiroshima, around the Seto Inland Sea, Kyoto and Tokyo. 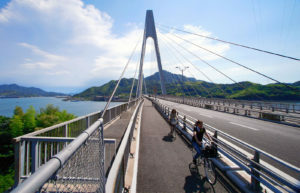 The main cycling part of the tour covers the famous Shimanami Kaido route that crosses 7 bridges between the islands of the Seto Inland Sea. The actual Shimanami Kaido route is around 85km and can be cycled in one day, but instead we have broken it into several days so we can set a leisurely pace. The bridges are feats of modern engineering and lead to wonderful small villages where fishermen haul in their catches, women garden in the rice fields and local children stop and wave to cyclists. “Our tours are not about sticking solidly to itineraries, or about making great times on the bikes…we take it as it comes! If we see a brilliant photograph ready to be snapped, we stop…if we find a friendly person to chat to, we stop! It’s about exploring, discovering and riding at a pace that means we don’t have to worry about being exhausted at the end of the day, when there is always a glass of chilled Japanese beer or sake to be found,” Tina added. On our last few days we stay in wonderful city of Kyoto where we will hire e-bikes from a local company. I’m lucky enough to have visited Kyoto about 20 years ago when I worked for a Japanese company but it was a work trip and I didn’t have a lot of time to look around. So I’m really looking forward to seeing it at a leisurely pace and being very ‘zen-like’ in the Zen Gardens. While I’m travelling I’ll be using social media to keep you all updated so make sure you follow me on the Women Who Cycle Facebook page, Twitter and Instagram. So stay tuned for updates on the Wheel Women Japanese Cycling tour. As always feel free to use the comments or the Women Who Cycle Facebook page to make contact. Previous Post:Been looking for the ideal cycling holiday in the south of France? I’m so eager to see your posts about your trip! I just finished reading a wonderful book by the cyclist Josie Dew about her cycling trip to Japan; title is “A Ride in the Neon Sun”. I’d love to make that journey. (Also, I just ordered a Specialized Diverge e5 Comp and I’d like to know how you like yours. I’m still waiting for mine to be delivered.) Have an amazing trip!